Senator Trillanes IV is pointing his hand again to Mayor Duterte because of the not publicly announced bank account but Senator Cayetano claims that this kind of propaganda was for the benifit of his presidential candidate Sen. Grace Poe. Cayetano said that Trillanes is known as supporter of the lady presidential bet, Trillanes personally told him that he will follow Poe’s orders during the start of the campaign. "Unang-una Senator Trillanes is not the Senator Trillanes you know in the Senate right now. He is now a Poe-tector. Ang trabaho ni Senator Trillanes isa lang: tumira sa mga kalaban ni Senator Poe," claimed by Sen. Cayetano to the reporters in an ambush interview. He alleged said, "Nung nag-umpisa ang kampanya sinabi ni Senator Trillanes, kung ano sabihin sa kanya ni Grace, gagawin niya. Sinabi 'wag niya upakan si Sen. Chiz [Escudero], gagawin niya ito. So ngayon na ginagawa ni Senator Trillanes ito (claims against Duterte), walang duda na may go signal ng core group at ni Senator Grace." On the other hand, Sen. Cayetano defended Rodrigo Duterte on the issue thrown to him. He showed a chart of their authorized waiver to all local and foreign currencies both here and abroad signed by him and Duterte. According to Cayetano, they submitted (signed waiver) to their rivals last March 11 and can be verified with the Bangko Sentral ng Pilipinas and any bank. He said, "Kung may bank account kami na ‘di nakadeclare sa SALN sa aming government officials, bakit kami pipirma nito? Bakit sila ang ‘di pumirma? Even si Vice President (Jejomar) Binay ang gusto niya sa AMLC (Anti-Money Laundering Council) lang waiver, hindi yung sa bangko." It's all a desperate attempt by the Poe team to smear the name and reputation of Mayor Duterte para makahabol sila sa eleksyon, said by Senator Cayetano. What do you think on the undeclared bank account of Duterte? Share your thoughts below. 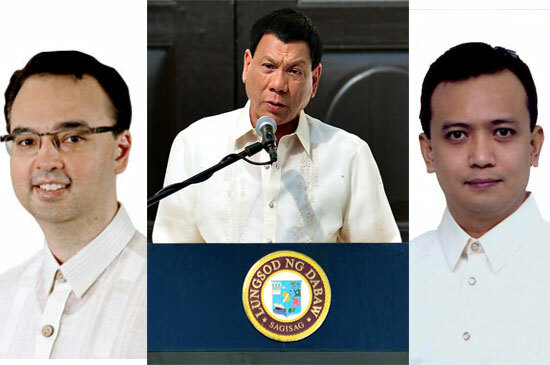 Comments or suggestions about "Alan Peter Cayetano defends Duterte and calls Trillanes as a ‘Poe-tector’ " is important to us, you may share it by using the comment box below.